The students are demanding that the NIT campus be shifted out of Kashmir, action be taken against police officials involved in lathicharge of the students last Tuesday and action against officials of the NIT who according to them are involved in anti-national activities. 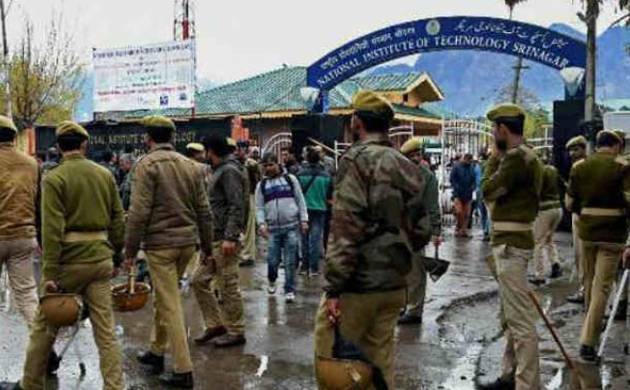 Fresh protests today rocked the National Institute of Technology (NIT) here as the outstation students took out a march in the campus to press for their demands which includes shifting the institute out of Kashmir. A group of students tried to march towards the main gate but were stopped by the security force personnel on duty inside the campus, officials said. They said the students wanted to interact with the media personnel camping outside the main gate of the institute at Hazratbal. “Those (students) who choose to leave (for home) will be provided another opportunity to appear in the minor in lieu of the minor, which is scheduled from 11th to 14th of April,” an order issued by the office of the Registrar said. The state government has ordered a time-bound inquiry into the incidents of violence on April 1 and April 5, triggered by clashes between local and outstation students over India’s loss to the West Indies in the World T20 Cup semifinals last week. “We have instituted an enquiry to go into the incidents at the NIT,” Deputy Chief Minister Nirmal Singh said yesterday. He said Additional District Magistrate Srinagar will conduct the inquiry and submit his report within 15 days. Police have also registered two separate FIRs regarding the incidents of student violence that took place on NIT Srinagar campus last Friday and Tuesday. The first FIR was registered against unknown persons for the clashes between outstation and local students on April 1, a day after India lost to West Indies in the semi-final of the World T20 Cup. The police has invoked sections 148 (rioting), 149 (unlawful assembly), 427 (mischief), 336 (endangering life of others) and 323 (voluntarily causing hurt) of the Ranbir Penal Code (RPC) for the clashes between local and outstation students that took place last Friday. In the second FIR registered on April 5, the police, besides slapping the charges of the previous FIR, has added sections 353 (assault on public servant) and 188 (disobedience to order duly promulgated by public servant). While no one has been named in the two FIRs yet, the official said police is investigating the video evidence of violence that took place on the days of incidents.